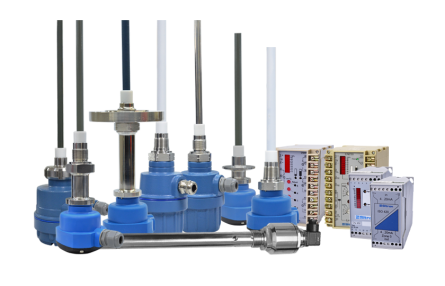 Sitron’s Capacitive Level Probes are primarily used to measure and control the level in various industrial processes. They can be applied in conductive or non-conductive mediums such as water, oil, solids, pastes, chemicals and other mediums as well. In addition, probes can be used to detect the interfaces between liquid (water / oil). Like all of Sitron’s products the Capacitive Probes can be made with a variety of connections such as threaded flange or sanitary. The SC120 features a nylon, aluminum or 316SS housing, 316SS, PTFE tubed or Halar coated rods and 3 choices of DIN rail mounted panel indicator relays (CN202, CN200 or CN205). The CN202 relay features a 0 to 100% bar graph indicator, 4…20mA output and Zero & Span adjustment. The CN200 relay features 2X SPDT relays, a 0 to 100% bar graph indicator, 4…20mA output and Zero & Span adjustment. The CN205 relay features 5X SPDT relays, a 0 to 100% bar graph indicator and Zero & Span adjustment. The SC404 features integrated electronics within a small nylon or aluminum housing. The SC404 with large aluminum enclosure feature integrated electronics with integrated galvanic isolator. The ISO420 is a Galvanic Isolator to be used with the SC404 (with nylon or aluminum housing).